Enthusiasts argue that point-of-care ultrasonography extends the scope of the physical exam far beyond what can be auscultated through a stethoscope. 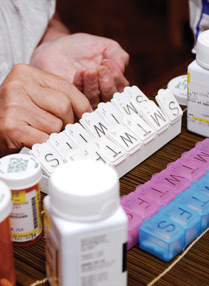 Detractors worry about overdiagnosis and a loss of medical skills that have intrinsic value. Both sides seek balance when considering how to use this new technology. 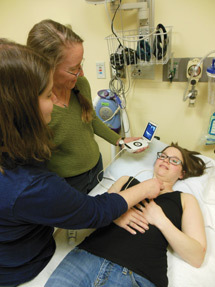 As ultrasound devices become increasingly portable and affordable, they open up the opportunity for expanded use by primary care doctors, although some question whether such a move would be cost-effective. The devices, which can be small enough to be carried in one hand, are already being used by emergency physicians to quickly identify trauma-related hemorrhages, collapsed lungs, and other critical conditions. Other uses range from office-based screening of potentially malignant thyroid nodules to ultrasound guidance of difficult-to-inject joints in arthritis patients. More than 20 medical specialties have developed various diagnostic and treatment applications, according to a 2011 review article published in the New England Journal of Medicine. Enthusiasts argue that point-of-care ultrasonography, as it's sometimes described, can extend the scope of the physical exam far beyond what's audible through a stethoscope. Noted cardiologist Eric Topol, MD, FACP, author of the book “The Creative Destruction of Medicine,” has lauded the devices as one of medicine's potentially transformative tools. But the specter of yet another diagnostic tool makes some physicians edgy, to say the least. The relative value of various imaging tests has been a recurrent theme in the “Choosing Wisely” campaign, an American Board of Internal Medicine Foundation initiative. With these portable devices, doctors might unnecessarily worry patients about other potential medical problems they stumble across that weren't even the focus of the image, resulting in additional costs and sleepless nights, said Charles Cutler, MD, MACP, immediate past chair of ACP's Board of Regents and an internist in Norristown, Pa. According to Dr. Narula, a professor of medicine and cardiology at New York City's Mount Sinai School of Medicine, it can be challenging for even experienced internists to differentiate subtle heart and lung sounds via stethoscope during a physical exam. Meanwhile, physicians in training are becoming more reliant on imaging technology anyway and thus are less adept at diagnosing worrisome conditions, such as severe valvular stenosis, through a stethoscope, he said. Handheld devices have evolved to mirror the accuracy of the traditional echocardiogram, said Dr. Narula, citing a 2005 study in Heart as one illustration. Researchers identified a 98% agreement between handheld cardiac ultrasound and the traditional echocardiogram in detecting major heart abnormalities in 217 patients. In 78% of the patients, the portable device provided sufficient information to avoid a traditional echocardiogram, according to the findings. Also, the researchers noted, in 17% of the cases in which a cardiologist felt a physical exam was sufficient to rule out any heart worries, the handheld device accurately detected major abnormalities. Another study, which reviewed 42 articles on handheld devices published from 1978 to 2004, found that the technology is particularly useful in the emergency setting, for community screening, or in remote areas with limited medical access. The device has “a high level of diagnostic accuracy” in terms of identifying left ventricular systolic dysfunction, left ventricular hypertrophy, and pericardial effusion but is not as precise in assessing regional wall motion abnormalities, right ventricular dysfunction, and valvular lesions, according to the authors of the research overview, which was published in 2004 in CHEST. But echocardiography isn't suffering from underutilization—far from it, said H. Gilbert Welch, MD, a professor of medicine at the Dartmouth Institute for Health Policy and Clinical Practice. Dr. Welch co-authored a study, published in Archives of Internal Medicine in 2012, finding that nearly a third (28.5%) of Medicare patients have an echocardiogram in a 3-year period, among whom 55% get a second test within 3 years after their first. Janice Boughton, MD, FACP, an Idaho internist, said she doesn't subscribe to such pessimistic prophecies. Dr. Boughton, who purchased a handheld ultrasound device for slightly more than $8,000 in early 2012, said that it can quickly rule out potential medical concerns, thus saving patients days or longer waiting on further imaging and other test results. Dr. Boughton also described how she can use the device to identify myriad other issues, including worrisome fluid in the abdomen or the lungs, any signs of kidney blockage, or dehydration. Her focused exam is designed to diagnose or rule out specific medical conditions and requires only a handful of images and no more than 5 minutes to complete, she said. Overall, she said the technology allows her to treat patients more quickly and accurately, limiting their hospital stay in the process. In some cases, such as when the patient comes in with chest pain, Dr. Boughton uses the portable device to rule out the most immediately life-threatening causes, such as dangerous fluid around the heart or a recent heart attack. That gives uninsured patients the option to return home to wait for the results of the hospital echocardiogram and other test results, rather than fretting about costly hours of hospital observation, she said. 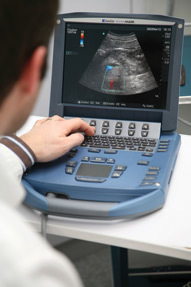 Bernard Rubin, DO, FACP, pointed out that portable ultrasound devices aren't just used for diagnosis. They also can assist the delivery of some treatments, such as when the image helps doctors to better administer corticosteroids and other injections, said Dr. Rubin, who is the division head of rheumatology at Henry Ford Hospital in Detroit. As the devices have become more portable in recent years, shrinking to roughly the size of a laptop computer, they can help doctors more precisely guide injections. That approach may be preferable for the more challenging joints, such as those in the fingers, toes, or hip, Dr. Rubin said. “From a patient comfort standpoint, every time you hit the bone, it's exquisitely painful,” he noted. The image also can provide a degree of comfort for residents or younger doctors who haven't had as much practice with joint injections now that advances in biologics and other medications have eased inflammation, he said. Still, the long-term impact of these devices is unknown, and the risk of proliferating images shouldn't be discounted, said Dr. Welch, author of the book “Overdiagnosed: Making People Sick in the Pursuit of Health.” He was involved in a recent study, published online Feb. 20 in JAMA Otolaryngology-Head & Neck Surgery, that identified a wide gap between thyroid cancer mortality and incidence. While the mortality rate has remained stable from 1975 to 2009, the rate of diagnoses has nearly tripled during that time span. Imaging likely plays a notable role, Dr. Welch said. Already, some thyroid malignancies are detected by serendipity, when the scan was initially ordered to look at the chest or some other area, he said. “The more we start looking at the thyroid carefully, the more nodules we'll find, the more biopsies there are, and the more thyroids that will come out,” he said. 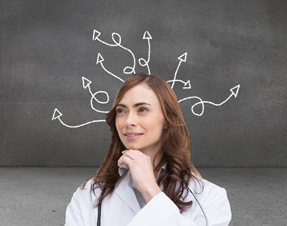 Correctly interpreting an ultrasound is a technical skill, one that can take time to learn, pointed out a New England Journal of Medicine editorial published March 20, which looked at the pros and cons of training medical students in point-of-care ultrasound. The authors noted that cardiology fellows already require 4 to 6 weeks to learn the basic echocardiographic exam. But the editorial also cited several medical schools that have moved forward, incorporating the technology into anatomy classes and later on rounds, including the University of South Carolina and the University of California, Irvine. The medical students at Mount Sinai School of Medicine also are being trained to examine the heart, lungs, and other organs with the portable technology, Dr. Narula said. Mount Sinai also offers an 8-hour course to its internal medicine residents. As the devices become more affordable, he said, they will migrate further into physician offices. Based on conversations with manufacturers, Dr. Narula predicts that the price tag will drop from roughly $8,000 currently to $2,000 within the next 2 years. Dr. Boughton, who works locum tenens and as a staff hospitalist at Gritman Medical Center in Moscow, Idaho, has racked up numerous training hours as she's embraced the technology. She's used her scheduling flexibility to complete several courses, ranging from a few days to a month long. After her first short course, she felt like her diagnostic capabilities had improved, but she's continued to learn through additional training and patient interaction. “I feel like I can teach it now, but I don't feel like I've stopped getting better,” she said. Drs. Cutler and Welch would prefer to see the brakes applied a bit on such enthusiasm, before the devices become a common sight in primary care settings. A randomized trial is needed to weigh the quality and cost of care with the portable devices compared with the traditional assessment approach, Dr. Cutler said.